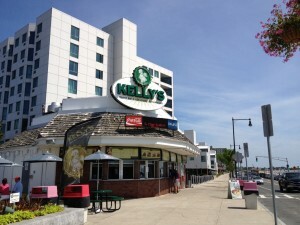 I’ve been to Kelly’s a handful of times, but it was always the outposts (Medford and Saugus), never the original, which has been located on Revere Beach Boulevard since 1951. I decided it was time to go, sit on the beach and eat some fried clams. It was really early (11am), so the line was non-existent. 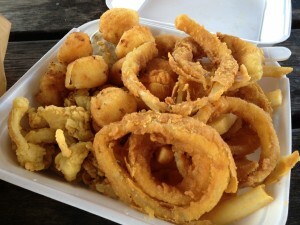 I got the fried clam and fried scallop combo plate ($18). It came with fries and rings (love when they do that!). There are a couple of tables on the sidewalk, but why sit there when you can cross the street and be on the beach? Sadly, the clams were a disappointment; the soft breading fell off the clams, which barely had any flavor. The scallops fared somewhat better, but were small and greasy. I barely touched the oil sodden fries and rings. I think the oil was not set at the right temperature. Clam Box in Ipswich is heads and shoulders (and bellies) above this. If you don’t want the long drive, Tony’s in Quincy is still a better bet and is on the water as well.